The modern Oregon industry was built by families creating small wineries that catered to customers on a very personal level. That tradition still exists widely in Oregon today despite the influx of rich investors and the corporatization of wineries through acquisitions. The pioneers, many of which came from California, established the welcoming spirit that engaged visitors in their endeavors. The resultant growth in new vineyards and wineries over the past fifty years has been remarkable, and by the end of 2016 there were 725 wineries and 30,435 planted vineyard acres. Visitors to Oregon wineries currently contribute over $207 million to the Oregon economy. As many readers know, I like to champion the small, family owned producers because their background stories and dedication is unrivaled. Pinot Noir responds to meticulous farming and winemaking, and the smaller producers often provide this caring approach. This past July, I spent several days in the Willamette Valley calling on small wineries, several of which I had never visited although they had been kind enough to send me their wines for review. I looked in on other wineries that I had not visited in some time. 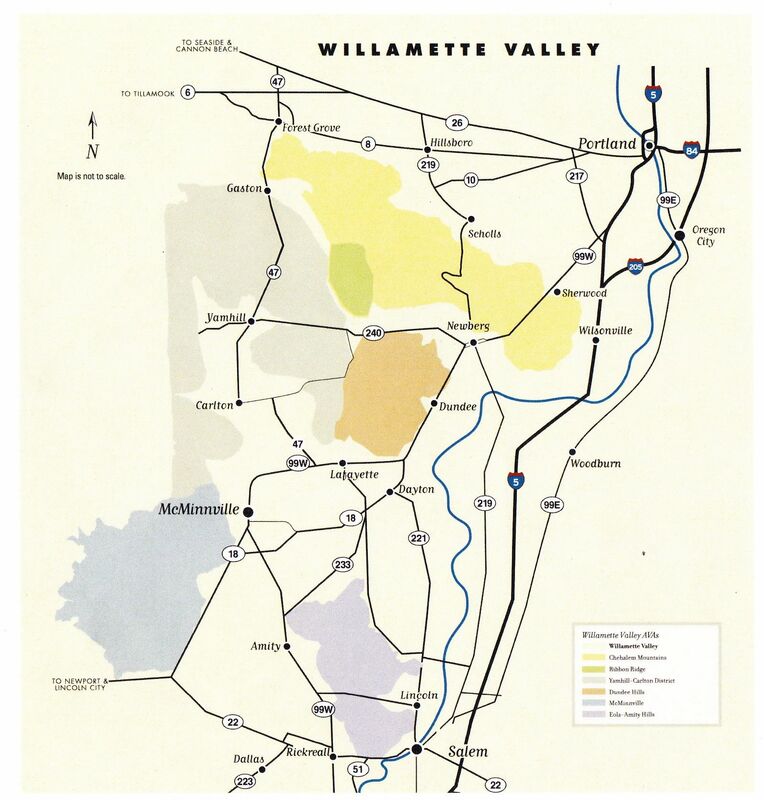 The Willamette Valley appellation, established in 1984, is subdivided into six appellations: Chehalem Mountains, Ribbon Ridge, Yamhill-Carlton, Dundee Hills, McMinnville and Eola-Amity Hills. 82% of Oregon’s Pinot Noir is planted in the Willamette Valley. All appellations are reachable within 45 to 90 minutes by car from Portland. Most visitors to the Willamette Valley use lodging in Newberg, Dundee or McMinnville as their base of operations although there are numerous B&Bs scattered throughout the Valley. The best way to approach winery visits is to concentrate on one appellation a day to minimize driving. Some wineries are an adventure to find and will take you on seldom traveled country roads. Some of the more southerly wineries are located in the Willamette Valley appellation but outside the six sub appellations and take additional time to reach. Refer to map of the Willamette Valley below. Most small wineries require an appointment to visit. This is preferable because you most likely will receive a very personal experience. All the Willamette Valley wineries are open Memorial Day and Thanksgiving Day weekends. Remember, it rains a lot in the Willamette Valley in the winter, so you may want to plan a trip from Memorial Day through October. A large regional map can be obtained from the Willamette Valley Wineries Association at www.willamettewines.com. An interactive map of the region is also available on this website: www.willamettewines.com/about-the-valley/regional-map/. A downloadable PDF “Guide to Willamette Valley Wineries is available also at www.willamettewines.com/brochure/. Numerous touring companies operate in the Willamette Valley but they often neglect the smaller, family owned wineries hidden throughout the region. Helicopter tours are also available, but again, the focus is on the larger wineries. If you are planning a trip to visit wineries in the Willamette Valley, you can contact me at prince@princeofpinot.com and I would be happy to give recommendations and assist you in obtaining appointments. I need to update the list of some recommended wineries to visit in the Willamette Valley at www.princeofpinot.com/travel_picks/#willamette_valley.